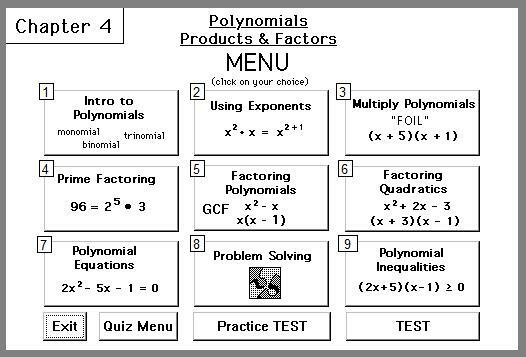 Learn all the exponent rules and factoring methods. This interactive tutorial math software begins with the introduction to polynomials, an extensive study of the laws of exponents, mutliply binomials with the FOIL method, multiply polynomials, learn prime factoring, factoring polynomials with both few terms and many terms, learn to factor quadratics, solve polynomial equations and inequalities, and apply understanding in a word problem section. 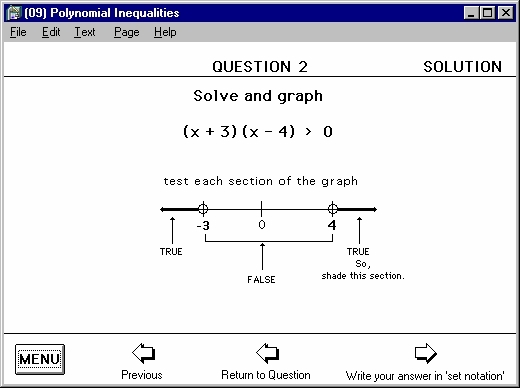 This algebra software program concludes with a test of understanding. A factoring practice test is available and includes hints and complete algebra solutions. A 'real' test on all the factoring methods concludes the program and the student is provided with a score and an evaluation of the topics in this math software program which require further study. Algebra help is always available for every problem in this factoring program.